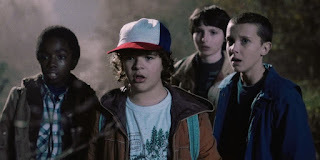 It should come as no surprise to those that read my alternate monthly blog that Stranger Things was a massive hit with me. For those who haven’t seen the smash Netflix hit of the summer, it tells the tale of mid-80s rural America and four young friends, one of whom goes missing. The story unfolds as a homage to 80s sci-fi horror a la John Carpenter and Stephen King, with a dash of Spielberg BMX riding fun to glue it together. I blogged in June about my childhood love of the hobby, and the influence it had on my writing, and indeed the writing of many others. Undoubtedly it had similar influences on the Duffer brothers who wrote and directed the eight episode story. The first five minutes of episode 1 capture much of what invigorated so many with the hobby: the friendships, the excitement, the imagination. As a narrative device it works perfectly for the series. The three remaining friends use their interest in fantasy and science fiction to rationalise the increasingly bizarre events of psychic powers, parallel universes (explained brilliantly), and… monsters. 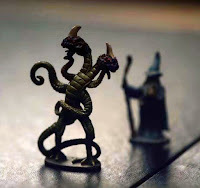 The repeat reference to the monster as ‘Demogorgon’ is a real nod to the 1st Edition DnD, before concern that all fantasy gamers were Satanists purged the following editions of demons and devils. In the version played in the show, Demogorgon is the Prince of all demons, in the lowest levels of the Abyss. His two mandrill heads and tentacles made for an awesome miniature, which was slammed onto the table in that epic first minute of the show, and that reappeared as a way of explaining ‘monsters’ to El in a later episode. To the players it is the ultimate monster to be conquered, and the banter between the friends is whether against such a creature it is better to defend or attack. It is this dilemma that drives the series through to its incredible finale. In my childhood experience of DnD, I only experienced a mild amount of teasing and mockery. Our close-knit group who played, both when I lived in Leeds and later Peterborough, weren’t especially ‘outcasts’ or ‘alternative.’ Perhaps at that time, the UK was more acceptant of stranger hobbies. We all collected comics, loved sci-fi, played DnD, some had computers (ZX Spectrums, Atari, VIC 20s), most of us liked music we taped off the radio. 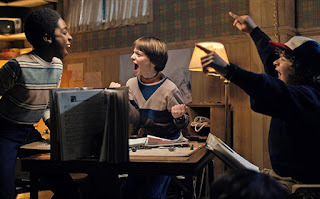 The bullying that the three friends experience in the show is only partly related to their love of DnD, in that it gives the bullies recourse to call them names and mock their close friendships. And of course, the general perception of DnD at the time in both UK and the US wasn’t entirely rosy. Much in the way that the moral majority rallied against heavy metal music, alleging its influence on the youth of America’s moral upbringing, mental stability and suicide rates, DnD came into the righteous cross-hairs. The now infamous Jack Chick comic strip, Dark Dungeons, tells the tale of Debbie whose participation in DnD games led to her involvement in a coven mainly to get her father to buy DnD books and miniatures. The DnD provoked suicide of a friend then brought Debbie back to Christianity and redemption. The strip culminates in a good old book burning, perhaps with some Harry Potter books tossed on to help the pyre (of course I’m being facetious, as Harry Potter book burning was a product of more recent enlightened times). The unfortunate Debbie in Dark Dungeons. As amusing as it seems now, there was serious anti-DnD propaganda back in the 80s, and even the famed Tom Hanks starred in the TVM Mazes and Monsters in 1982, wherein a latent psychotic illness is unlocked by the fantasy game, Mazes and Monsters, with tragic results. The film was based mainly on the sensationalism surrounding the disappearance of a student at MSU. The 80s were replete with pressure groups against DnD, in some cases driven by religious sentiments and the perception of DnD as an occult phenomenon, and in some cases bereavements and tragedy. Authors jumped on the bandwagon, associating a horrific murder with the fact the perpetrator (Chris Pritchard) was a Dungeon Master (and playing down his drug and alcohol addiction, and desire to inherit $2 million). Yet most studies don’t indicate that players of role playing games have any higher rates of mental illness, suicide, or depression, but such studies are often ignored in the media. Did it appeal to the geekier cross-section of society? Certainly, as back then they would have been the ones with the imaginations, and the creativity to enjoy it fully. Nowadays these would be the same children and teenagers stereotyped as gamers, the same ones unfairly mocked about hunting Pokemon, by a society determined to deride anyone else’s interests and fun! Yet it is these traits, of imagination, creativity, and ultimately comradery and friendship which are the core of the heroes in Stranger Things. It’s these characteristics that lead them to accept El, and to search for their missing friend when everyone else has given up. And that’s the message in Stranger Things, and that’s one of the keys to its success—Demogorgon or no. (As an end-note, the series has got my kids fired up about playing old school DnD again, ironically dragging them away from the aforementioned Pokemon!!). Ross M Kitson, features writer. Ross is a doctor, occasional blogger, full-time geek, and sporadic author of fantasy and YA sci-fi. Connect with Ross on Twitter. my opinion and not Ross'! #2Cents. Thanks for the comment, Gary. I agree it's sad that the 'moral majority' gained such a foothold on the back of fear about RPGs and music. It was a much lighter atmosphere here in the UK q.v the US. When I told my kids they were astonished, even moreso when I told them that in more recent memory people were torching Harry Potter books (in 2001). It's a shame that many of the positive aspects of faith are tarnished by the extreme representatives.